Camping is one of those times when you commune with nature, so why would you be less environmentally conscious when camping than at home? Unfortunately, a number of people use disposable plasticware while camping and then throw it away or worse, burn it in the fire. People argue about the health implications of using plastic utensils, but in terms of being green, it is clear that using something that doesn’t decompose one time and then throwing it away is NOT green. 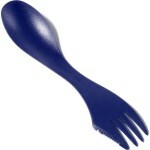 Instead of using one-time use plastic utensils, get a couple sets of reusable camping silverware and wash them. Odds are you are washing pots and pans already when out camping. In the scheme of things, adding some silverware to the clean-up process is negligible. You have a lot of options for camping utensils so it shouldn’t be too hard to find something to suit your preferences. We have Acetal silverware because it is light, relatively heat resistant, dishwasher safe (for after the camping trip) and inexpensive. You can pick up a set for under $3. Also popular are Lexan and metal utensils. I remember using those nested metal fork, spoon, knife sets in the Boy Scouts as a kid. If weight is less of an issue, such as when you are car camping, reusing an old set of metal silverware works well. In researching this article, I also found that Sporks are becoming popular for camping gear where one end is a spoon and the other a fork. Just don’t try to twirl your spaghetti in this spoon! One tip for picking out utensils is to get a color other than neutral or white. When we first took reusable utensils camping not all of the people we were camping with realized that we were NOT using plastic silverware and threw some of the pieces away! Now pretty much everyone we camp with has their own set, so the main problem is sorting out whose is whose at the end of the trip. Another good reason to have a unique color. 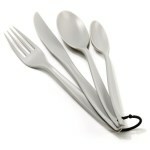 If you do take plastic silverware with you, don’t think of it as one-time-use items. Wash and reuse them and treat them as reusable items. Tell us: What do you use for utensils when you camp? Previous Post: New Garden: Starting Seedlings Indoors or in the Garden? Next Post: Earth Hour 2011 Coming Up Fast!